Find this week Dollar General deals, valid February 11 – February 17, 2018: 3/$6 General Mills Cinnamon Toast Crunch or Cookie Crisp 11.25-12.2 oz. or Kellogg’s Raisin Bran, Raisin Bran Crunch, Frosted Mini-Wheats or Rice Krispies 12-18.7 oz. ; 2/$5 Doritos; /$10 Coca-Cola; $1.50 Campbell’s Chunky Or Progresso Soup; starting at $1 Plush Favorites; starting at $1 Artificial Flower With 2 in. Bear, Cylinder Vase, Glass Gems, Greeting Cards, Classroom Exchange Cards Or Valentine’s Balloons; $1 Valentine’s Items; $3.95 Purex Liquid Laundry Detergent 36-50 Load/65-75 oz., Sun Liquid Laundry Detergent 86-100 Load/ 150 oz. or Snuggle Liquid Fabric Softener 41 Load/100 oz. ; $1 DG Home Facial Tissue Cube 75 ct, Lotion 60 ct. Or Flat 100 ct, Paper Towels 1 Roll Or Smart & Simple Bath Tissue 6 Rolls; $5 DG home Essentials Prints Paper Towels; $34 ZTE Blade Vantage Android; $1.50 Pillsbury Frosting 15.6 oz. or Clover Valley Food Coloring 1 oz. ; $1.50 Little Debbie Nutty Bars, Oatmeal Creme Pies, Swiss Rolls or Honey Buns; 2/$4 Keebler Cookies 11.3-11.5 oz., Club Crackers 13.7 oz. or Scooby Doo Graham Crackers 11 oz. ; and more. 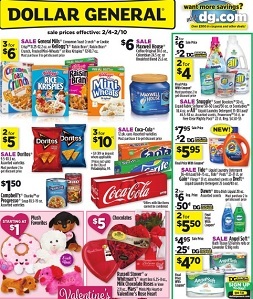 Find all deals and offers in the latest Dollar General Weekly Ad for your local store.